Detnews.com has a good read this morning by Charles Krauthammer that goes in part like this ...ask your Martian: Which is the more important battle? He would not even understand why you are asking the question... Al-Qaida has provided the answer many times. Osama bin Laden, the one whose presence in Afghanistan presumably makes it the central front in the war on terror, has been explicit that "the most serious issue today for the whole world is this Third World War that is raging in Iraq." Al-Qaida's No. 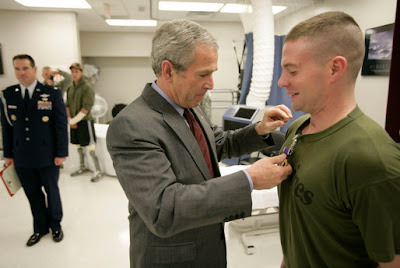 2, Ayman al-Zawahiri, has declared that Iraq "is now the place for the greatest battle of Islam in this era..."
President George W. Bush presents the Purple Heart to U.S. Marine Lance Cpl. Joshua Ryan Bleill of Greenfield, Ind., during a visit Friday, March 30, 2007, to the Walter Reed Army Medical Center in Washington, D.C. Bleill is recovering from injuries sustained in Operation Iraqi Freedom. Al Qaeda's use of chlorine gas against civilians and use of children as suicide bombers highlights the terror organization's barbarity, a Joint Staff spokesman said here today. Al Qaeda extremists in Iraq are using chlorine canisters and chlorine-carrying trucks to attack civilian targets, said Army Maj. Gen. Michael D. Barbero, Joint Staff deputy director for operations. On March 23, Barbero said, Iraqi police foiled an attack in Ramadi that could have caused catastrophic casualties. The police intercepted a truck carrying 5,000 gallons of chlorine and two tons of explosives. On March 28, two chlorine-laden trucks exploded outside the Fallujah military operations center. The attack injured 14 U.S. troops and 57 Iraqis. "I strongly believe that this use of chlorine should not be dismissed simply as a new tactic or an emerging trend," Barbero said. "Chlorine is a poison gas being used on the Iraqi people. 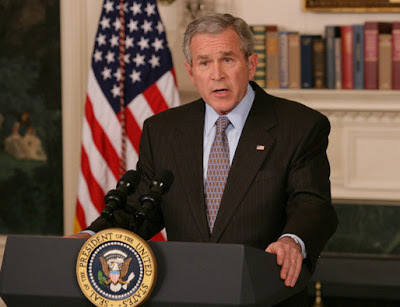 Before these attacks, the last time poison gas was used on the Iraqi people was by Saddam Hussein." Al Qaeda in Iraq and related Sunni extremists are using this weapon against the Sunni population of Anbar province. "We have Sunni extremists attacking innocent Sunnis with a poison gas," Barbero said. Coalition officials see the escalation as a response to the Iraqi people's growing sentiment against the terror organization. Al Qaeda is trying to intimidate the people of the province, Barbero said. Its actions show that al Qaeda in Iraq is not an "honorable resistance" aimed at "driving out the infidels," the general said. The terrorists continue to use children to launch attacks. On March 28, Iraqi police went after a suspicious vehicle in Haditha. "As they drove past a 12-to14-year-old boy riding a bicycle, a bomb in the boy's backpack detonated, killing him instantly," Barbero said. "These acts - the use of poison gas and the use of children as weapons - are unacceptable in any civilized society and demonstrate the truly dishonorable nature of this enemy," he said. Pelosi Refusing to Support British on Iran? * The supplemental appropriations bill that passed the Senate on March 27, calling for a date certain withdrawal from Iraq, is nothing more than a guaranteed date of surrender. * It is a refusal to acknowledge the dire consequences of failure, in terms of the stability in the Middle East and the resulting impact on the security of all Americans, whether home or abroad. * Democrats have chosen the politically expedient position of failure rather than putting aside the small politics of the day in the interest of our nation and the values upon which this nation rests. * We the undersigned remain steadfast in our support for the war against terrorism and mindful of the consequences of failure in Iraq, even if Nancy Pelosi and Harry Reid refuse to acknowledge those consequences. * We support our troops and the new strategy and believe it should be given the opportunity to succeed. American national security interests are directly at stake. Success or failure in Iraq is the transcendent issue for our foreign policy and our national security. People say they want to defeat the terrorists, but if we withdraw from Iraq prematurely, it will be the terrorists' greatest triumph. * If we leave Iraq based on an artificial timetable, al Qaeda will be free to plan, train for and conduct operations from Iraq just as they did in Afghanistan before 9/11. DoD’s American Forces Press Service has a good read today by John D. Banusiewicz, that goes in part like this... In a speech to the Republican Jewish Coalition Leadership in Manalapan, Fla., Cheney said some people believe pulling out of Iraq before the country can fend for itself would strengthen the hand of the United States in the war on terror. "This myth is dangerous because it represents a complete validation of the al Qaeda strategy," he said. "The terrorists do not expect to be able to beat us in a stand-up fight. 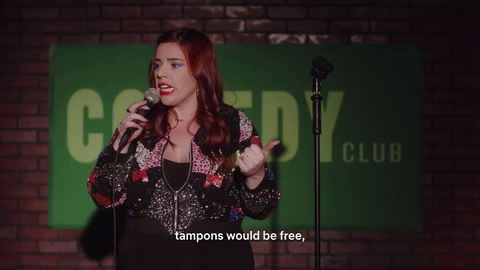 They never have, and they're not likely to try. The only way they can win is if we lose our nerve and abandon the mission -- and the terrorists do believe that they can force that outcome. 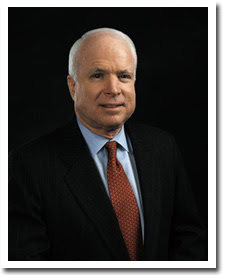 "Time after time, they have predicted that the American people do not have the stomach for a long-term fight," he continued. "They've cited the cases of Beirut in the '80s and Somalia in the '90s. These examples, they believe, show that we are weak and decadent, and that if we're hit hard enough, we'll pack it in and retreat." Master Sgt. Sean M. Thomas, 33, of Harrisburg, Pa., died March 27th in Baghdad, Iraq, when his unit came in contact with enemy forces using indirect fire during combat operations. Thomas was assigned to the 28th Division Support Command, Harrisburg, Pa.
For more information in regard to this release the media can contact the Pennsylvania Army National Guard at (717) 861-8468. Staff Sgt. Marcus A. Golczynski, 30, of Lewisburg, Tenn., died March 27th from wounds received while conducting combat operations in Al Anbar province, Iraq. Golczynski was assigned to Marine Forces Reserve's 3rd Battalion, 24th Marine Regiment, 4th Marine Division, Nashville, Tenn.
For more information in regard to this release the media can contact the Marine Forces Reserve public affairs office at (504) 678-4177. Coalition Forces killed four terrorists and detained 15 others during operations targeting foreign fighter facilitator and al-Qaeda in Iraq networks Thursday morning. In Mosul, ground forces entered a targeted building and were fired upon by four armed men. Ground forces returned fire, killing the armed terrorists. During the raid, ground forces also detained two suspected terrorists. Intelligence reports indicated the targeted individuals were involved in several improvised explosive device attacks on Coalition Forces in the area. During an operation in Baghdad, Coalition Forces detained nine suspected terrorists allegedly involved in al-Qaeda related foreign fighter facilitation. A raid of a foreign fighter safe house netted two suspects northwest of Haditha and two others were detained during a raid south of Fallujah targeting al-Qaeda finance operations and foreign fighter facilitation. “Successful Coalition operations continue to disrupt al-Qaeda in Iraq operations, restrict the flow of foreign fighters and reduce the terrorist organization’s manpower pool,” said Lt. Col. Christopher Garver, MNF-I spokesperson. Spc. Sean K. McDonald, 21, of Rosemount, Minn., died March 25th in Baghdad, Iraq, of wounds suffered when an improvised explosive device detonated near his vehicle. McDonald was assigned to the 9th Engineer Battalion, 2nd Brigade Combat Team, 1st Infantry Division, Wiesbaden, Germany. For further information on this Soldier, contact the 1st Armored Division public affairs office at 011-49-611-705-4859. Sgt. Curtis J. Forshey, 22, of Hollidaysburg, Pa., died March 27th in Homburg, Germany, of a non-combat related illness. Forshey was assigned to the 129th Combat Sustainment Support Battalion, 101st Sustainment Brigade, 101st Airborne Division, Fort Campbell, Ky.
For more information in regard to this release the media can contact the Fort Campbell public affairs office at (270) 793-9966. Don’t even try to run as a Republican in your wonderful state of Nebraska this upcoming election. You are no Republican. Most Americans, yet sadly not all of them, will never vote for a defeatist. You are a perfect example of just that. 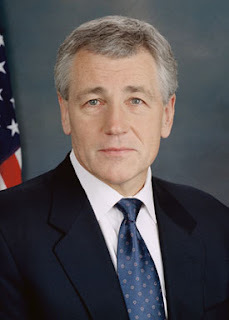 Senator Hagel -- I hope you are proud of yourself for turning your back on the War... the Troops... their families... and your Political Party. Hope you enjoy your fellow Defeatist Democrat friends. One civilian was killed and seven were injured after a suicide bomber detonated his vehicle in northwest Ramadi at 1:20 p.m. Tuesday. The injured were evacuated to a local aid station, Ramadi General Hospital and a Coalition medical facility for treatment. Coalition Forces arrived after the explosion to assist in the medical evacuation and set up a cordon around the blast site. Local citizens provided information about a second truck bomb that may be in the area. Acting on the tip, a search was conducted and an abandoned truck was found wired with explosives and chlorine tanks. Our heart is saddened to find out today that the White House Press Secretary Tony Snow’s cancer had returned and has spread to his liver. The following is on The White House website... President Bush on Tuesday said, "Obviously, a lot of folks here in the White House worry a lot about their friend, as do Laura and I. And so my message to Tony is, stay strong; a lot of people love you and care for you and will pray for you. And we're hoping for all the best. I'm looking forward to the day that he comes back to the White House and briefs the press corps on the decisions that I'm making and why I'm making them." The Department of Defense announced today the death of four soldiers who were supporting Operation Iraqi Freedom. They died March 25th in Baqubah, Iraq, when an improvised explosive device detonated near their vehicle during combat operations. They were assigned to the 5th Squadron, 73rd Cavalry Regiment, 3rd Brigade Combat Team, 82nd Airborne Division, Fort Bragg, N.C.
Sgt. Jason W. Swiger, 24, of South Portland, Maine. Cpl. Jason Nunez, 22, of Naranjito, Puerto Rico. Pfc. Orlando E. Gonzalez, 21, of New Freedom, Pa.
Pfc. Anthony J. White, 21, of Columbia, S.C. The aircraft carrier USS John C. Stennis entered the Persian Gulf today escorted by the guided-missile cruiser USS Antietam. While in the gulf, the flagship of the USS John C. Stennis Carrier Strike Group and its air wing, Carrier Air Wing 9, will conduct a dual-carrier exercise with the USS Dwight D. Eisenhower Carrier Strike Group. This marks the first time the Stennis and Eisenhower strike groups have operated together in a joint exercise while deployed to the U.S. 5th Fleet area of responsibility. "This exercise demonstrates the importance of both strike groups' ability to plan and conduct dual task force operations as part of the U.S. long-standing commitment to maintaining maritime security and stability in this region," officials said. Two air wings from the aircraft carriers will conduct air warfare exercises, while the surface components will conduct exercises in three general disciplines: anti-submarine, anti-surface and mine warfare. John C. Stennis left its homeport of Bremerton, Wash., on Jan. 16 for deployment and began operating alongside coalition maritime forces in the region Feb. 19. After arriving, the strike group began conducting maritime security operations and providing direct support to coalition ground forces participating in Operation Enduring Freedom in Afghanistan. During the 33 days of operations over Afghanistan, Carrier Air Wing 9 provided close-air support and reconnaissance to International Security Assistance Force troops on the ground. Maritime security operations help set the conditions for security and stability in the maritime environment, as well as complement counterterrorism and security efforts of regional nations. These operations deny international terrorists use of the maritime environment as a venue for attack or to transport personnel, weapons or other material, officials said. The Carrier Air Wing 9 squadrons include the "Black Knights" of Strike Fighter Squadron 154, "Blue Diamonds" of Strike Fighter Squadron 146, "Argonauts" of Strike Fighter Squadron 147, "Death Rattlers" of Marine Strike Fighter Squadron 323, "Yellowjackets" of Tactical Electronic Warfare Squadron 138, "Golden Hawks" of Carrier Early Warning Squadron 112, "Topcats" of Sea Control Squadron 31, "Eightballers" of Helicopter Anti-Submarine Squadron 8, and "Providers" of Fleet Logistics Support Squadron 30. The John C. Stennis Strike Group includes John C. Stennis, Carrier Air Wing 9, Destroyer Squadron 21, USS Antietam, the guided-missile destroyers USS O'Kane and USS Preble, and the fast combat-support ship USNS Bridge. More than 6,500 sailors and Marines are assigned to the strike group. U.S. Army Staff Sgt. Juan Alba (left), Cpl. Joseph Casiano (2nd from left), Spc. David Tunstall (3rd from left) and an Iraqi National Police officer conduct a combined cordon and search foot patrol at a market in Ghazaliya, Iraq, on March 23, 2007. The soldiers are from Black Hawk Company, 1st Battalion, 23rd Infantry Regiment, 3rd Brigade Combat Team, 2nd Infantry Division. Cpl. Henry W. Bogrette, 21, of Richville, N.Y.
Lance Cpl. Trevor A. Roberts, 21, of Oklahoma City, Okla.
Bogrette died March 22nd while conducting combat operations in Al Anbar province, Iraq. He was assigned to Combat Logistics Battalion 6, 2nd Marine Corps Logistics Group, II Marine Expeditionary Force, Camp Lejeune, N.C.
Roberts died March 24th while conducting combat operations in Al Anbar province, Iraq. He was assigned to Marine Forces Reserve's 2nd Battalion, 14th Marine Regiment, 4th Marine Division, Oklahoma City, Okla.
For more information in regard to Bogrette the media can contact the 2nd Marine Logistics Group public affairs office at (910) 451-3538. For more information in regard to Roberts the media can contact the Marine Forces Reserve public affairs office at (504) 678-4177. Iraqi Police apprehended a suicide truck bomber and captured his vehicle, containing a large quantity of chlorine and explosives, when it failed to detonate in Ramadi March 23rd. At approximately 1:30 p.m., a white cargo truck came to a halt near the entrance to the Jezeera police station, located about 150 meters from a water treatment plant. The police approached the truck for further investigation and detained the driver when they discovered the truck was rigged with explosives and the driver was attempting to detonate the vehicle. Upon further investigation, the truck contained an unknown number of 55-gallon drums, which were used to camouflage five 1000-gallon barrels filled with chlorine and more than two tons of explosives. The driver is being held for further questioning and all explosives were removed from the truck and destroyed by demolition experts. Did you ever get that funny feeling that the other shoe is fixing to drop??? Sgt. Greg N. Riewer, 30, of Frazee, Minn., died March 23rd in Habbaniyah, Iraq, of wounds suffered when an improvised explosive devise detonated near his HMMWV during combat operations. He was assigned to the 2nd Combined Arms Battalion, 136th Infantry, 1st Brigade Combat Team, 34th Infantry Division, Bemidji, Minn.
For further information on this soldier, contact the Minnesota Army National Guard public affairs office at (651) 268-8949 or after hours at (651) 775-4392. Sgt. Adrian J. Lewis, 30, of Mauldin, S.C., died March 21st in Ramadi, Iraq, of wounds suffered when his unit came in contact with enemy forces using small arms fire during combat operations. He was assigned to the 3rd Battalion, 69th Armor Regiment, 1st Brigade Combat Team, 3rd Infantry Division, Fort Stewart, Ga.
For more information on this soldier, contact the Fort Stewart public affairs office at (912) 767-2479. Spc. Lance C. Springer II, 23, of Fort Worth, Texas, died March 23rd in Baghdad, Iraq, of wounds suffered when an improvised explosive device detonated near his unit while on combat patrol. He was assigned to the 1st Squadron, 40th Cavalry Regiment, 4th Airborne Brigade Combat Team, 25th Infantry Division, Fort Richardson, Alaska. For further information on this soldier, contact the U.S. Army Alaska public affairs office at (907) 384-1524. Sgt. Freeman L. Gardner Jr., 26, of Little Rock, Ark., died March 22nd in Baghdad, Iraq, of wounds suffered when an improvised explosive device detonated near his unit while on combat patrol. He was assigned to the 18th Engineer Company, 3rd Stryker Brigade Combat Team, 2nd Infantry Division, Fort Lewis, Wash.
For further information on this soldier, contact the Fort Lewis public affairs office at (253) 967-0152 or (253) 967-0154. The first Coalition Forces base, the Old State Building in Basrah City, was handed over to the Iraqi Army March 20. The Iraqi Army took control of the base in a 45-minute-long parade which saw the raising and lowering of the flags of each country. A Press conference to mark the occasion at Basra International Airport was attended by Governor Wa'ili - the Governor of Basrah, General Habib - the General Officer Commanding 10th Division Iraqi Army, Major General Shaw - the General Officer Commanding Multi-National Force (South-East), and the British Consul General Richard Jones. 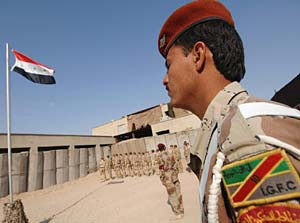 Shaw commented on 10 Division's remarkable achievement and how the handover reflected the significant progress that has been made in the south towards complete Iraqi security self-reliance. 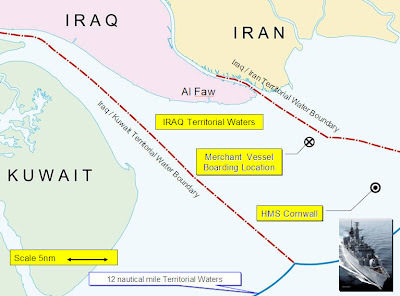 He stated that over the coming months two further bases, Shaibah Logistics Base and the Shaat Al'Arab Hotel, will also be transferred to full Iraqi control. "True to the Coalition Campaign Plan, and in consultation with my Iraqi colleagues, we are beginning a gradual transition whereby security will be handed over to the Iraqi Army and the Iraqi Police Service,” Shaw said. "10 Division's operations on Operation Sinbad, its strike operations in Basra and its courageous performance in Baghdad all show that it is a force of emerging capability. Our joint goal is for Al Basrah province to achieve Provincial Iraqi Control, and this is a goal I am sure we all share for Al Basrah." Captain Emad Khalaf of the Iraqi Army is to become the new officer in command of the Old State Building, located in the centre of Basra. Chindit Company from the 2nd Battalion The Duke of Lancaster's Regiment have occupied the Old State Building since November 2006 after taking over from B Company 1st Battalion The Light Infantry. They are now moving into Basra Palace. During their time at the Old State Building Chindit Company have endured many attacks on the base. "The Old State Building has been a very demanding base. It's probably one of the most heavily attacked locations in Iraq. For the guys to be up in the sangars [Guard look-out posts] every night and getting up there despite being shot at, RPG'd and mortared at least every other night is fantastic from them. It's turned the company into a much stronger company. 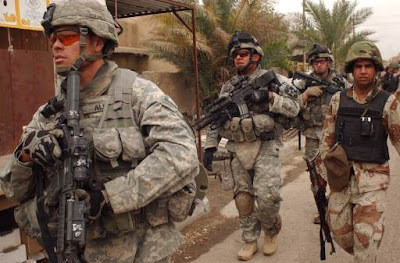 It's a good place to be and a good hard tour to do, but it is time that we moved on and handed it to the Iraqis,” said Platoon Commander Lt. Bradley Pino. "The only bad thing I feel about leaving is that we're leaving our home. We came here and started here and I'd like to finish here but it's a step forward for the Iraqis. I think the locals have put up with us being here and we've provided some security for them but I think the Iraqis will do a better job. It's one of those places where they know the area, they know the people and they're ready to take over control of the security in the area – I think they'll do a better job, a different job to what we've been doing here." The House has passed the Democrat's Emergency Supplemental Bill. They are: Wayne Thomas Gilchrest from Maryland’s 1st district and Walter B. Jones of North Carolina’s 3rd district. * More to come... Like one POed President!!! Today I'm joined here at the White House by veterans, family members of people serving in combat, family members of those who have sacrificed. I am honored that they have joined me here today. Here in Washington, members of both parties recognize that our most solemn responsibility is to support our troops in the war on terror. Yet, today, a narrow majority in the House of Representatives abdicated its responsibility by passing a war spending bill that has no chance of becoming law, and brings us no closer to getting our troops the resources they need to do their job. The purpose of the emergency war spending bill I requested was to provide our troops with vital funding. Instead, Democrats in the House, in an act of political theater, voted to substitute their judgment for that of our military commanders on the ground in Iraq. They set rigid restrictions that will require an army of lawyers to interpret. They set an arbitrary date for withdrawal without regard for conditions on the ground. And they tacked on billions for pet projects that have nothing to do with winning the war on terror. This bill has too much pork, too many conditions and an artificial timetable for withdrawal. As I have made clear for weeks, I will veto it if it comes to my desk. And because the vote in the House was so close, it is clear that my veto would be sustained. Today's action in the House does only one thing: it delays the delivering of vital resources for our troops. A narrow majority has decided to take this course, just as General Petraeus and his troops are carrying out a new strategy to help the Iraqis secure their capital city. Amid the real challenges in Iraq, we're beginning to see some signs of progress. Yet, to score political points, the Democratic majority in the House has shown it is willing to undermine the gains our troops are making on the ground. Democrats want to make clear that they oppose the war in Iraq. They have made their point. For some, that is not enough. These Democrats believe that the longer they can delay funding for our troops, the more likely they are to force me to accept restrictions on our commanders, an artificial timetable for withdrawal, and their pet spending projects. This is not going to happen. Our men and women in uniform need these emergency war funds. The Secretary of Defense has warned that if Congress does not approve the emergency funding for our troops by April the 15th, our men and women in uniform will face significant disruptions, and so would their families. The Democrats have sent their message, now it's time to send their money. This is an important moment -- a decision for the new leaders in Congress. Our men in women in uniform should not have to worry that politicians in Washington will deny them the funds and the flexibility they need to win. Congress needs to send me a clean bill that I can sign without delay. I expect Congress to do its duty and to fund our troops, and so do the American people -- and so do the good men and women standing with me here today. 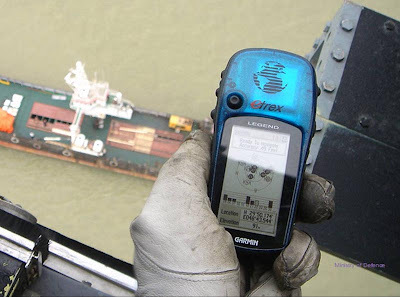 BBC News is reporting this morning that fifteen British Navy personnel... were seized at 10:30 local time when they boarded a boat in the Gulf, off the coast of Iraq, which they suspected was smuggling cars... The Royal Navy said it was doing everything it could to secure the release of its personnel, who are based on HMS Cornwall... 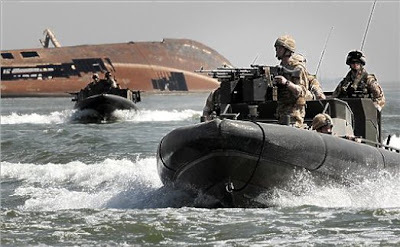 It added that the men had been carrying out a routine patrol in Iraqi waters. 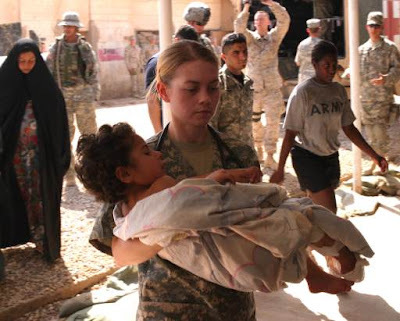 A U.S. Army soldier carries a wounded Iraqi child into the Charlie Medical Center on Camp Ramadi, Iraq, for medical evaluation on March 20, 2007. The child is one of several Iraqis who were attacked by anti-Iraqi forces after they allegedly told coalition forces of insurgent activity in the 1st Battalion, 6th Marine Regiment area of operations. Sgt. Nicholas J. Lightner, 29, of Newport, Ore., died March 21st at Walter Reed Army Medical Center, Washington, of wounds suffered when an improvised explosive device detonated near his unit while on combat patrol March 15th in Baghdad, Iraq. Lightner was assigned to the 1st Squadron, 8th Cavalry Regiment, 2nd Brigade Combat Team, 1st Cavalry Division, Fort Hood, Texas. Sgt. 1st Class Darrell R. Griffin Jr., 36, of Alhambra, Calif., died March 21st in Balad, Iraq, from wounds suffered when his unit came in contact with small arms fire during combat operations. Griffin was assigned to the 2nd Battalion, 3rd Infantry Regiment, 3rd Stryker Brigade Combat Team, 2nd Infantry Division, Fort Lewis, Wash.
For more information in regard to this release the media can contact the Fort Lewis public affairs office at (253) 967-0152 or (253) 967-0154. Pfc. Joey T. Sams II, 22, of Spartanburg, S.C., died March 21st at Camp Buehring, Kuwait, of injuries suffered when he was pinned between two vehicles. His death is under investigation. Sams was assigned to the 1st Battalion, 15th Infantry Regiment, 3rd Brigade Combat Team, 3rd Infantry Division, Fort Benning, Ga.For more information in regard to this release the media can contact the Fort Benning public affairs office at (706) 545-3283. Spc. Curtis E. Glawson Jr., 24, of Daleville, Ala., died March 20th in Baghdad, Iraq, of wounds suffered when an improvised explosive device detonated near his vehicle. 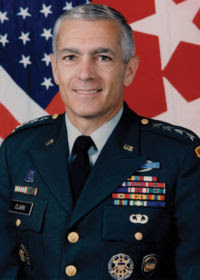 Glawson was assigned to the 610th Brigade Support Battalion, 28th Infantry Regiment, 4th Infantry Brigade Combat Team, 1st Infantry Division, Fort Riley, Kansas. Over the past several days, Coalition forces in Basra and Hillah captured Qais Khazali, his brother Laith Khazali, and several other members of the Khazali network, an organization directly connected to the kidnapping and murder in January of five American soldiers in Karbala. Yesterday in Baghdad, Coalition forces captured the individual believed to be the head of the Rusafa car bomb network, the Al Qaeda-Iraq organization responsible for some of the horrific bombings in eastern Baghdad in recent weeks. In yesterday’s operation and in another operation early this morning, Coalition forces also captured three other individuals believed to be key members of the network, a vehicle prepared as a car bomb, and a cache of weapons and explosives. Early this morning in Mosul, Coalition forces captured a former Saddam Fedayeen leader involved in setting up training camps in Syria for Iraqi and foreign fighters. These actions, and others underway, reflect intensified and even-handed efforts to reinforce the rule of law in Iraq. They have also been complemented by recent initiatives to promote dialogue and reconciliation in Iraq. We will provide further details of the ongoing initiatives and operations as they become available. “...I am choosing to do what I believe is best for my State. I will focus my time and energy for the next nine months on the people's work, not politics. 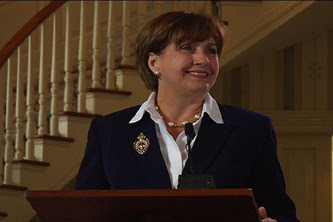 After much thought and prayer, I have decided that I will not seek reelection as your governor. There is nothing more important to Louisiana's future than a strong recovery, free from politics. With that said... I can see now that I’ll have to start posting some on the upcoming Governor’s Race in Louisiana. We might just be able to get a Republican in office this round... but it’s going to be a very hard race for us to win with Blanco now out of it. The Department of Defense announced today the death of two soldiers who were supporting Operation Iraqi Freedom. They died March 20th in Baghdad, Iraq, when an improvised explosive device detonated near their vehicle during combat operations. They were assigned to the 1st Battalion, 28th Infantry Regiment, 4th Infantry Brigade Combat Team, 1st Infantry Division, Fort Riley, Kansas. Sgt. Wayne R. Cornell, 26, of Holstein, Neb. Pfc. Stephen K. Richardson, 22, of Bridgeport, Conn.
For further information on these Soldiers, contact the Fort Riley public affairs office at (785) 239-3410. Sgt. 1st Class John S. Stephens, 41, of San Antonio, Texas, died March 15th in Tikrit, Iraq, of wounds suffered when his patrol came under attack during combat operations. He was assigned to the 1st Battalion, 16th Infantry Regiment, 1st Brigade, 1st Infantry Division, Fort Riley, Kansas. Sgt. Nimo W. Tauala, 29, of Honolulu, Hawaii, died March 17th in Muqdadiyah, Iraq, of a non-combat related injury. He was assigned to the 209th Aviation Support Battalion, Combat Aviation Brigade, 25th Infantry Division, Schofield Barracks, Hawaii. The incident is under investigation. For further information on Stephens, contact the Fort Riley public affairs office at (785) 239-3410. For further information on Tauala, contact the Schofield Barracks public affairs office at (808) 655-4815. Coalition and Iraqi forces killed 17 terrorists, detained about 90 suspected insurgents, and found several weapons caches in operations throughout Iraq in the past three days, military officials reported. Coalition forces killed five terrorists, destroyed a bomb-making factory and detained three suspected terrorists during an operation today near Taji. As ground forces entered the target buildings, they encountered several armed men. Coalition forces used self-defense measures, killing five terrorists and detaining three suspected terrorists. During the raid, coalition forces discovered an adjacent building was being used as an explosives factory. Inside the building, coalition forces found large-caliber ammunition and explosive manufacturing materials including numerous 50-gallon barrels of explosive material. Coalition forces conducted an air strike to destroy the explosives factory, associated vehicles, ammunition and weapons. Elsewhere, Amiriyah police and Marines from Regimental Combat Team 6 engaged armed groups of al Qaeda for more than five hours today, killing eight insurgents and wounding five, south of Fallujah, near the town of Amiriyah. Iraqi police posts observed sporadic enemy mortar fire for about one hour this morning. 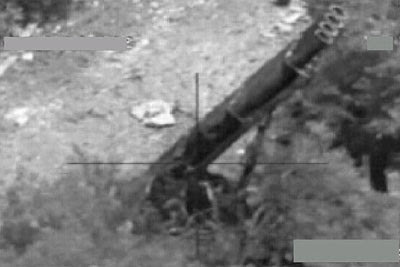 Marine artillery units assigned to RCT6 identified the location of the mortar team and counter-fired, forcing the al Qaeda in Iraq attackers to flee the scene. Amiriyah police then received sporadic enemy fire from an unknown number of insurgents. The police positively identified the enemy gunfire and returned fire, killing two insurgents and wounding five. Five policemen were wounded during the engagement. Enemy fire continued sporadically throughout midday, when supporting fixed-wing aircraft engaged about 20 insurgents with guided munitions and strafing fire. Six insurgents were killed and their vehicles were destroyed as a result. The five wounded policemen were transported to a local hospital and treated. In other operations, coalition forces destroyed a weapons cache and detained 23 suspected terrorists today during raids targeting foreign fighter facilitators and al Qaeda in Iraq networks. During a raid near Balad, coalition forces detained 10 suspected terrorists and found a large amount of weapons in two targeted buildings. The weapons found included numerous machine guns, assault rifles, AK-47s, grenades, a rocket-propelled grenade launcher and a DShK anti-aircraft heavy machine gun. Due to the large amount of weapons found, coalition forces destroyed the two buildings and the weapons inside to prevent further use by terrorists. West of Taji, coalition forces captured three suspects with alleged ties to car bomb operations and foreign fighter facilitation. Six suspected terrorists believed to be involved in foreign fighter facilitation were detained in Mosul. Coalition forces also conducted a raid west of Abu Ghraib targeting foreign fighter facilitators. During the raid, ground forces detained four suspected terrorists at the targeted building. In other developments, the western Ramadi district police conducted a massive police operation targeting insurgents yesterday in Ramadi. Coordinating between several stations within his district, Brig. Gen. Khalil Ibrahim Hamadi, chief of the Ramadi district police, personally led more than 500 policemen as they conducted house-to-house searches in the capital city of Anbar province. "The sons of Ramadi work tirelessly to eradicate criminals and bring them to justice," Khalil said. "Today we achieved a noble goal in providing security and stability to our families and the people of Ramadi." During the 10-hour operation, named "Operation Lions of Ramadi," police detained more than 45 suspected insurgents, confiscated propaganda material and discovered several caches containing assault rifles, machine guns, and mortar and artillery shells used to produce improvised explosive devices. Insurgents using an IED during the operation killed one civilian and injured five. The wounded were transported by local citizens to a nearby joint security station, then evacuated to a coalition medical facility for further treatment. Elsewhere, at least four Iraqis were killed and 14 wounded when a suicide bomber detonated a car bomb yesterday in an eastern segment of the Iraqi capital. The attack occurred around 11:20 a.m. when a taxi packed with mortar rounds plowed into a crowd in the al-Sheik Omar area. An Iraqi army element from 4th Brigade, 1st Iraqi Army Division, and soldiers with the 2nd Brigade Combat Team, 2nd Infantry Division, responded to the blast and sealed off the area to prevent residents from approaching any unexploded ordnance. The injured were treated on the spot before being transported for further medical care. In another operation, coalition forces detained nine suspected terrorists yesterday during raids targeting the al Qaeda in Iraq network. In Mosul, seven suspected terrorists were detained with alleged ties to al Qaeda in Iraq and attacks against coalition forces and the Iraqi police. One of the detainees reportedly procures chemicals for the production of IEDs. 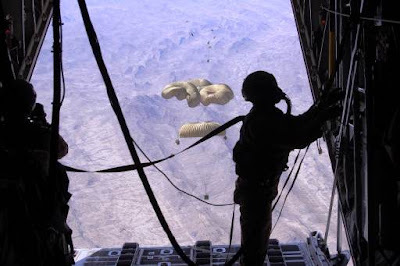 In another raid southwest of Abu Ghraib, coalition forces netted two suspected terrorists allegedly involved in moving foreign terrorists into Iraq. A contraband-search-turned-firefight yielded two caches for Multinational Division Baghdad soldiers March 19 in Falahat, Iraq. Soldiers from Troop C, 1st Battalion, 7th Cavalry Regiment, raided three buildings in Falahat, where they detained three suspected insurgents and confiscated two AK-47s, one shotgun and five magazines. Troop C was preparing to enter a fourth building when a vehicle with four men drove by and fired weapons at the soldiers, who reciprocated with shots of their own. Three of the men fled the scene on foot but were captured by the soldiers. Follow-on searches yielded the day's second cache: one 122 mm artillery shell, four fuses, one grenade, four rocket sleds, four ammunition vests, one AK-47 and more than seven magazines. In Ramadi, Iraqi police captured a suspected insurgent, reportedly linked to an IED cell, during operations with coalition advisors March 19. The suspect is allegedly involved in multiple bombing attacks targeting coalition forces and Iraqi security forces in the area. Iraqi forces detained three additional individuals for questioning. Separately, Iraqi army soldiers took three terrorists into custody during an operation March 19 near Taqa. Soldiers of the 4th Battalion, 4th Brigade, 6th Iraqi Army Division, detained the three men, who were found on a road that skirts the eastern bank of the Euphrates River, with materials for making IEDs. In another operation, Iraqi and coalition forces conducted a raid in the western Baghdad neighborhood of Kadamiyah on March 19. The raid was targeting suspected insurgents implicated in the placement of roadside bombs in the area. During the raid, elements of the 3rd Brigade, 4th Iraqi Army Division, entered the Abass Mosque. No contraband was found in the mosque and about 50 people were held in the area until the search was complete. All 50 from within the mosque were released. After the search, Iraqi and U.S. soldiers came under rocket-propelled-grenade and small-arms attack at about 9 p.m. from a separate group of 20 armed men in the same area. Coalition forces returned fire, killing three insurgents. Three men from the armed group were detained. U.S. military aircraft participated in the operation but did not expend any ordnance. 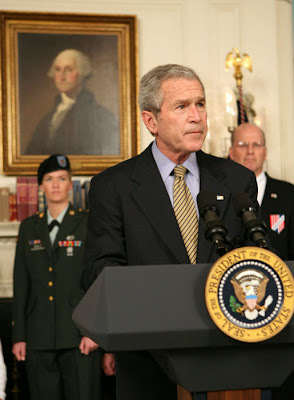 About Photo: President George W. Bush speaks to members of the media Tuesday, March 20, 2007 in the Diplomatic Reception Room of the White House, addressing the issues surrounding the firing of eight federal prosecutors.